Adapt materials: all kinds of stone. Applications: used for chemical, pharmaceutical, building materials, mining, coal, metallurgy industry pipeline operations. 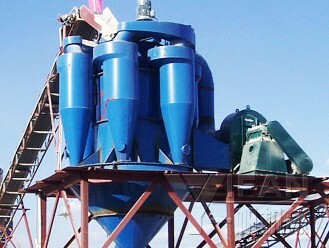 CXFL Series Powder Separators usually called powder concentrator. It is based on American technology, and is an ideal equipment to separate powder (≤0.075mm) from manufactured sand for dry way. It is very easy to control the powder ingredient of manufactured and meet different requirments of the clients. 1, the ground material from the upper part of the classifier hopper enter classifiers fall into one combined with the rotor propeller sprinkle trays on the one hand by the high-speed rotation of the Caesar trays, material inertial centrifugal force to the surrounding spreading out, subject to both the updraft effect produced by the propeller sprinkle trays blades up raised, forming materials boiling sprinkle trays on the propeller blades. The material finer particles float upward, was suspended dispersed state, while the thicker or heavier the material trays were scattered leaves dispersed along the cylinder wall fall, the completion of the first election powder. 2, sprinkle the bottom of the trays with cage rotor under 10 under cage rotor is rotated together with the spindle, the formation of a vortex airflow, the coarse heavy materials will fall along the cylinder wall material powder scattered, one of the fine powder to rise from circulating air back again grading, meal by the trickle device is discharged from the inner cone. 3, sprinkle the top of the feed tray has a cage rotor 6. On the cage rotor grading circle near the surface of the powder room, air flow and dispersed in the gas stream of material driven by the circle of the grading and classification circle with high-speed rotation, uniform strong vortex in the classification circle around airflow. The size of the stream of material by centrifugal force through the speed motor, the rotational speed of the spindle 3 is adjusted. When the speed increases, the force also increases. If you keep a certain amount of handling wind cut size will be reduced, Product tapering; if the speed is reduced, the product thicker. Thus the native fineness of the product in the course of their work according to the specific process requirements of the flexible adjustment of control, and improve the effect of the classification of the material particles, to improve the efficiency of the classifier. 4 on cage rotor grading of fine particles with circulating air to enter the external inpidual cyclone. New cyclone design uses two outlet structure, and additional wind deflector the snail angle at the air inlet, the inner cone additional reflective screen, additional deceleration plate at the lower end of the cyclone sleeve, so that the whirlwind a fluid resistance of the dust collector has dropped significantly. The circular plate under the action of the wind in the wind guide to higher wind speed into a cyclone collector. The enlarged portion in the snail angle Winds suddenly reduced to accelerate the particles from settling, but also improve the efficiency of the cyclone dust collector. The outlet from the next wind discharged directly into efficient dust collector, greatly reduces the dust content in the circulating air, reducing the finished product fineness. the particle size distribution is concentrated,particle size distribution more reasonable,3μm-30μm particles increased significantly,product quality has improved significantly. easy to operate,easy to adjust the fineness. easy to wear parts designed to wear protection,small amount of maintenance,long life of equipment. energy saving,the system unit power consumption than traditional ring flow system was reduced by 30 percent. can yield 60-80%,separator efficiency as high as 85-90%. easy installation,wind turbine equipped with a vibration damping base,can be directly used steel frame. low investment,easy operation and maintenance,especially for the old plant transformation. separator work in slightly negative pressure,no dust leakage,the production environment improved.